1 Shore length is an imprecise measure which may not be standardized for this article. Lake Michigan is one of the five Great Lakes of North America, and the only one in the group located entirely within the United States. It is bounded, from west to east, by the U.S. states of Wisconsin, Illinois, Indiana, and Michigan. Lake Michigan is hydrologically inseparable from Lake Huron, joined by the wide Straits of Mackinac. More than 12 million people live along Lake Michigan's shores. 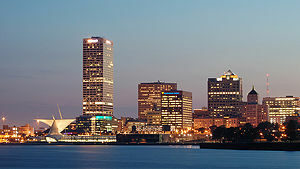 The great cities of Chicago and Milwaukee were settled and grew because of their locations on the lake. The southern tip of the lake is heavily industrialized. The beaches of Lake Michigan, especially those in Michigan and northern Indiana, are known for their beauty, earning the region the nickname the "Third Coast" of the United States after those of the Atlantic and the Pacific oceans. The word "Michigan" was originally used to refer to the lake itself, and is believed to come from the Ojibwa Indian word mishigami, meaning "great water." The lake is slightly larger than the nation of Croatia. Clovis Point remnants are evidence of the earliest inhabitants of the Lake Michigan region; the Old Copper Culture peoples left traces of their advanced coomunities from the copper pit mines of northern Lake Superior to the ancient forests now deep under the water of southern Lake Michigan. Up until about 1500 B.C.E. the landscape differed in other ways as well; the present-day Straits of Mackinac was a 300 foot (1000 m) deep riverine canyon. The Woodland People who gradually claimed the region from the Old Copper Culture were agriculturalists who were widely dispersed throughout the area of the Great Lakes. These were the people, in the process of joining with the vast Iroquois Nation, who were encountered by the first European explorers in 1615. Jean Nicollet, under orders from Samuel de Champlain, was the first European to travel into Lake Michigan through the Mackinac Straits, in search of the fabled Norhtwest Passage. The Jesuit Claude-Jean Allouez began missionary work among the Indians of Green Bay and the Fox River in 1668. The French missionary/explorer team of Marquette and Jolliet mapped the lake's western shore from Green Bay to Chicago in 1673. The first sailing ship was brought to the Lake in 1679 by Robert Cavelier, but was lost in a storm on its return east with a cargo of furs. Robert de La Salle eventually established a trading post near St. Joseph, Michigan. Lake Michigan (43°30'N, 87°30'W) is the only one of the Great Lakes wholly within the borders of the United States; the others are shared with Canada. It has a surface area of 22,400 square miles (58,016 km²), making it the largest freshwater lake in the U.S., the largest lake entirely within one country, and the fifth largest lake in the world. It is 307 miles (494 km) long by 118 miles (190 km) wide with a shoreline 1,640 miles (2,633 km) long. The lake's average depth is 279 feet (85 m), while its greatest depth is 923 feet (281 m). It contains a volume of 1,180 cubic miles (4,918 cubic km) of water. Its surface averages 577 feet (176 m) above sea level, the same as Lake Huron, to which it is connected through the Straits of Mackinac. 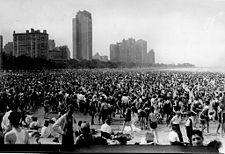 Crowd of bathers on the Lake Michigan beach, Chicago around 1925. Lake Michigan beaches, especially those beaches in Michigan and Northern Indiana, are known for their beauty and the region is often referred to as the "Third Coast" of the United States after those of the Atlantic and the Pacific oceans. 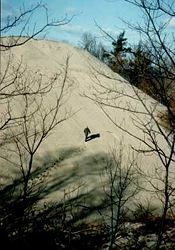 The sand is soft and off-white, known as "singing sands" because of the squeaking noise made when one walks across it, caused by its high quartz content. There are often high sand dunes covered in green beach grass and sand cherries, and the water is usually clear and cold (between 55 and 70 °F/13 and 21 °C) even in late summer. Lake Michigan beaches in northern Michigan are the only place in the world where one can find Petoskey stones, the state stone, aside from a few inland lakes in that region. The beaches of the western coast and the northernmost part of the east coast are rocky while the southern and eastern beaches are sandy and dune covered. This is partly because of the prevailing winds from the west which also cause thick layers of ice to build up on the eastern shore in winter. Chicago annually imports fresh sand to replenish the popular city beaches but much of the city waterfront is covered by seawalls, harbors or developments. Steel mills are visible along the Indiana shoreline, and the pollution caused by these mills is believed to contribute to the color of sunsets. The Chicago skyline can be seen from the Indiana shore, but when standing on the beaches in Wisconsin or Lower Michigan, it is impossible to see across the lake, providing a view similar to that found on ocean coasts. Geologically and hydrologically, Michigan and Huron are the same body of water (sometimes called Lake Michigan-Huron), but are geographically distinct. Counted together, it is the largest fresh water body in the world by surface area. The Mackinac Bridge is generally considered the dividing line between them. 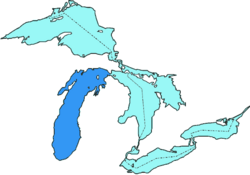 Both lakes are part of the Great Lakes Waterway. In earlier maps of the region, the name "Lake Illinois" has been found in place of "Lake Michigan." Sand dune on Lake Michigan at Indiana Dunes National Lakeshore. The dunes along the southern shoreline of Lake Michigan are the largest lake dunes in the world. Originally marking the ancient terminal reaches of the ice age lake, the dunes are fed by southward currents robbing the northwestern shoreline. The Indiana Dunes complex is a remarkable ecological preserve of the beech-maple climax community. The modern study of ecology was devised through the study of the Dunes by Henry C. Cowles of the University of Chicago. His exacting longitudinal observation of the dunes' plant communities led to a new understanding of the progression and interaction of plants and the environment over time. As dune grasses stabilized the dune, allowing for a steady build-up of organic material, larger plants could survive and thrive, eventually resulting in the forest complex anchoring the oldest of the dunes. 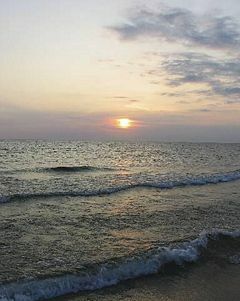 The Indiana Dunes, and the dunes of the eastern shore of Lake Michigan, notably the Sleeping Bear Dunes, remain a living laboratory for the study of interaction of plant and animal habitat, and human impacts on both. Lake Michigan has one of the longest water retention spans, nearly 100 years, of the Great Lakes. With a relatively small amount of water flowing out of the Lake, and the industrial complex stretching from Milwaukee, WI along the northern reaches of the Lake to Gary IN, at the southern tip, pollution from manufacturing and urban sources is of particular concern. The National Park Service maintains the Sleeping Bear Dunes National Lakeshore and Indiana Dunes National Lakeshore. Part of the shoreline is within the Hiawatha National Forest and the Manistee National Forest. The Michigan Islands National Wildlife Refuge is within the lake. There are numerous state parks located on the shores of the lake or on islands within the lake. ↑ 1.0 1.1 1.2 1.3 1.4 1.5 John W. Wright (ed.) and editors and reporters of The New York Times (2006). The New York Times Almanac, (New York, New York: Penguin Books, 2007, ISBN 0-14-303820-6), 64. ↑ Alliance For The Great Lakes. Lake Michigan Statistics Retrieved March 18, 2008. ↑ Sea Grant Michigan. Lake Michigan Retrieved March 18, 2008. ↑ The University of Chicago Faculty. Henry C. Cowles; Botany Retrieved March 18, 2008. ↑ University of Wisconsin Sea Grant Institute. All links retrieved June 20, 2018. This page was last modified on 20 June 2018, at 14:39.